Jazeman Jaafar, Malaysia’s leading international racing driver, had an impressive final pre-season Formula Renault 3.5 Series test at Jerez circuit in Spain this week. 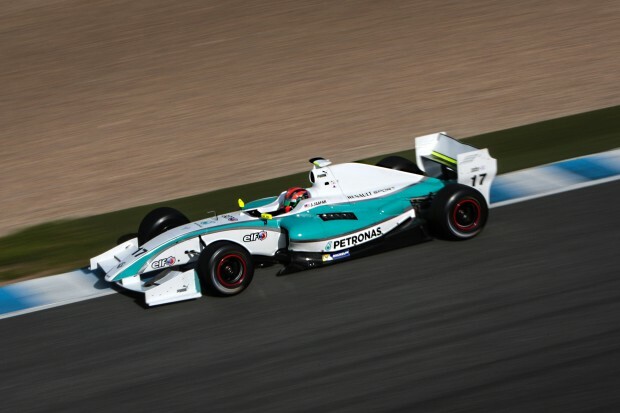 The PETRONAS Talent Development driver was top of the leader board on the first day of running and was comfortably in the top ten on the other two days of testing. Driving with the ISR team this year, Jazeman has quickly established an excellent rapport with the engineers and crew, translating this healthy relationship into a timesheet-topping performance. Jazeman’s quickest lap was set on the first morning, putting new tyres to good use and benefiting from the extra grip to lay down a lap time unmatched by any of his rivals through the rest of the day. On the second day of running Jazeman finished the day fourth quickest, another very strong performance from the 21-year-old driver. The ISR engineers continued to work closely with Jazeman on different aspects of their development programme and furthering their knowledge for the season ahead, as well as the Jerez race weekend which closes out the championship. The final day of testing was the final opportunity for the grid of Formula Renault 3.5 series cars to take to the Jerez track and Jazeman used his time efficiently throughout the day. In the morning he ran 25 laps of the 4.4 kilometre circuit and a further 32 laps this afternoon, focusing on long runs and reviewing the car’s handling with different fuel loads. At the conclusion of the three day test Jazeman said, “It’s been a very productive three days of testing and I’m feeling very excited about the season ahead. I’m really enjoying with the ISR team and we’ve made significant progress each day, learning more from each other and understanding more about the characteristics of the new tyres we’re using this season. Jazeman now returns to Kuala Lumpur to join the MERCEDES AMG PETRONAS F1 team at the 2014 Formula 1 PETRONAS Malaysia Grand Prix. The PETRONAS Talent Development driver Jazeman will have the opportunity to learn from being part of this programme, with privileged access to engineering meetings, furthering Jazeman’s racing education and experience.